03/15/97 : Added a 5 Meg Profile HD, several manuals and software. 09/09/98 : Acquired SoftCard /// new in box for $25.00. This was the first product to come out of Apple Computer as a company and it was plagued by defects from the start. Although Apple took the unheard of step of repairing all of the defective computers at no charge, this system was never as popular as it could have been and it became their first flop (the Lisa was their second). 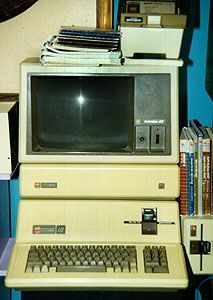 I was attracted to the machine because of its enhanced capabilities over the Apple II and its operating system, S.O.S. (Sophisticated Operating System) which evolved into ProDOS on the Apple II systems. If you are a SARASAUR or anyone with an interesting story about the Apple ///, why not pass it along. I'm in need of documentation, manuals, software and peripherals for this system so if you have any or can copy some doc for me please drop me a note. Check out my Apple Library.